Carryings On Up The Dale: Bastille Day defeat for the French. Bastille Day defeat for the French. Conrad, Paul S and Shaun came down for our Bastille Day wargame. We were using Paul’s own set of rules “Panoply of War” for a change. Much of the pre-game shenanigans have now been dispensed with so once we were deployed it was straight into the action. The game was set in Northern Italy in 1799. I commanded a joint Austro-Russian force while Conrad and Shaun had the French. Paul umpired. I say French but almost half of the army was drawn from the Lombard, Polish and Helvetic Legions, just to add a bit of colour to an already colourful pair of armies. Both armies were pretty evenly matched numbers wise in terms of infantry and artillery, although the Allied army had more cavalry (but only if you included the Cossacks). The one advantage the Allies had were four battalions of Russian grenadiers, but with the Russians needing to expend two order 'chits' each time they were given an order this advantage was more than compensated for, in my opinion anyway. The battlefield from the Allied left. The French refused their left flank completely, massing the bulk of their infantry in the centre with support from their two artillery batteries. 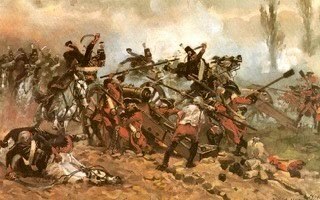 Their cavalry was held back in reserve, which was to prove to be a mistake as the game panned out. The Russians took the place of honour on the Allied right, with the Cossacks swanning about at the extreme of the line near the ruined aqueduct, while the Austrians held the centre with their infantry. All the Austrian cavalry was deployed on my left, which was also to prove to be an error on my part. 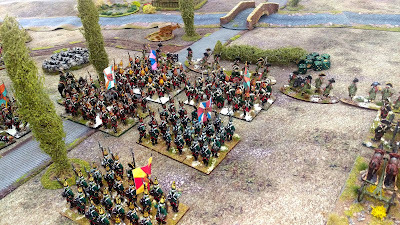 The French right, thinly held by a spread out demi brigade and a regiment of heavy cavalry. Austrian cheveau-legers led by a 'poor' general as designated in the rules which meant fewer orders to give. The Austrian artillery are deployed ready to pound the French centre. Looking to the right from the Austrian centre the main body Austrian infantry were held up trying to cross the river. At the start of the game we'd decided that as it was wide and shallow a throw of anything but a 1 would allow troops to cross unhindered, otherwise it'd be classed as difficult terrain. We promptly forgot the throw a 1 rule so my entire army was delayed for several turns trying to pledge across the bloody thing! Prince Bagration's Russian division. Four battalions of combined grenadiers, two (fusilier) battalions of the Moscow Grenadier Regiment, covered by the 7th Jagers. The French centre and left, which didn't extend beyond the vineyard once Conrad had shuffled his troops into position. Cossacks ride past the ruined Roman aqueduct. More Cossacks start their looting early. One of the French artillery's first shots destroyed an Austrian howitzer and caused the rest of the battery to retreat. Not a good start. The Polish Legion quickly drove the Russian jager out of the chapel, but the latter just withdrew to the vineyard where they remained for the remainder of the battle taking pot-shots at the Poles. The Russians finally get to the river and start to cross, covered by the rest of their jager. Shaun put his infantry on the right wing into square as he was faced by six units of Austrian cavalry. My cavalry on the left was now stuck with nowhere to go. At least the French right wing was now locked up tight. As the glorious sunshine beat down through the skylights the other Russian brigade crossed the river on my right flank. The Cossacks were already across and threatening the Lombard Legion skirmishers. More and more Russian grenadiers cross the river. They took quite a few casualties from enemy fire but being Russians just shrugged them off. Russian jager skirmishing with the Lombard Legion. Conrad's 12pdr battery (behind the smoke) wasn't especially effective during the game, but did cause some damage to O'Donnel's Freikorps, forcing them to pull back on one occasion. Meanwhile the Austrians had been making slow but steady progress towards the French centre. Shaun's horse battery tore great gaps in the leading Austrian battalion but it didn't falter. Dodging herds of sheep the Austrian reserves rushed forward. Seen from the French side of the river the Russian advance looked pretty unstoppable. The French decided to ignore the Russians crossing on the left as they'd never be engaged soon enough to alter the outcome. After bravely heading off across the river my cossacks then decided to stay put where they were and shake their fists menacingly at the Lombard Legion on Windmill Hill. 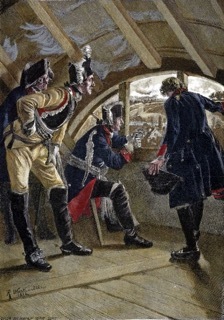 The French line was under pressure but holding, possibly inspired by the arrival of a portable guillotine. By the chapel the Poles were taking heavy casualties and were unable to stop the Russians from crossing the river. One uncoordinated Russian assault by two battalions was beaten back however by a battalion of the Polish Legion. On the other flank the French were struggling. Casualties were mounting and their skirmishers kept being driven back. 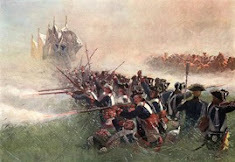 Despite heavy losses the Austrians charged the French line, forcing the horse artillery to make a tactical withdrawal. The French battalion seen here had been caught in square by the Austrian attackers and pushed back unceremoniously until they broke in rout. 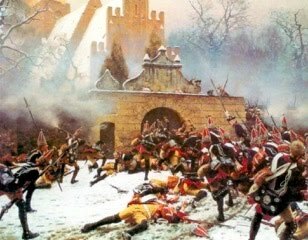 Meanwhile the Russians launched an all out assault on the French (and Poles) by the chapel, pushing the first line back. Suddenly the French left had all but collapsed with several battalions broken or pushed back. The Russians however overextended themselves and, caught by fresh French, lost two battalions of grenadiers broken in rout. However, the damage to the French was done. 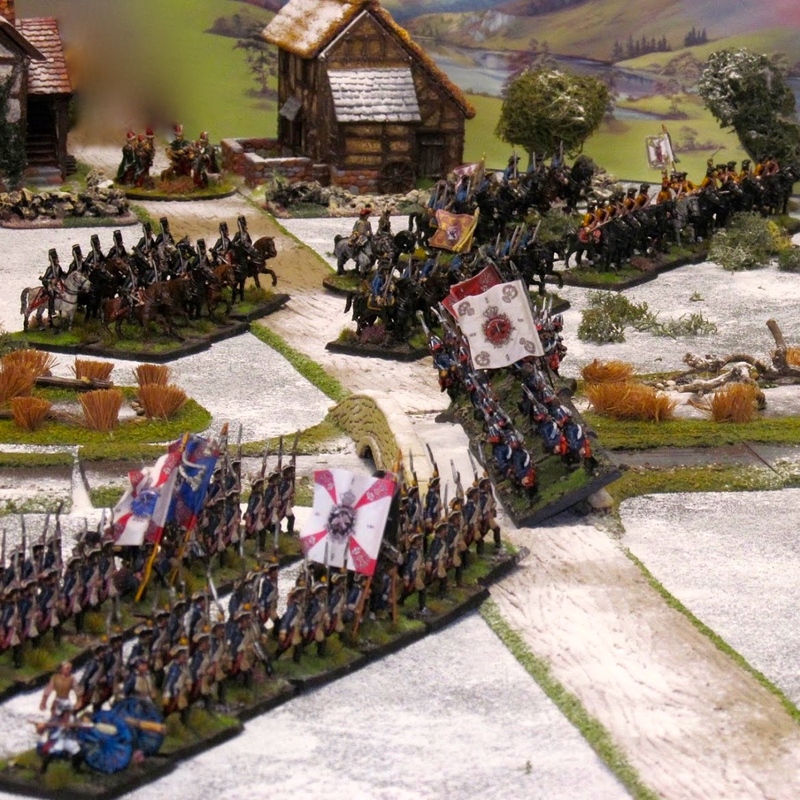 The Austrians were still moving ponderously forward in the centre, hampered as they were by poor terrain. O'Donnels Freikorps however had been trading shots with French skirmishers and artillery the whole battle and despite being targeted by the fashion conscious French artillery for their awful choice of uniforms, saw off all that was thrown against them. Not bad for a brand new unit on its first outing. More Austrians were closing on the French right which angled back to avoid being outflanked. The horse artillery rallied and some stability returned. Unfortunately there were still several uncommitted Austrian battalions and regiments of cavalry on this flank. (see below). 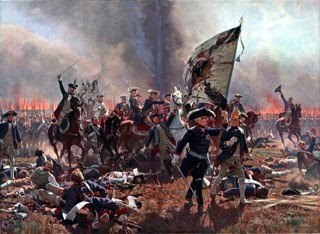 The Russians were now over the river in force, their grenadiers had all rallied and were poised ready for another push against the shattered French and Poles. The Lombard Legion on Windmill Hill was now trading shots with more Russian infantry and the cossacks, driving off two sotnias with a heroic charge by the Lombard Legion Hussars, and the Legion Helvetique was now isolated in the chapel. Shaun threw his 23rd Cavalry forward, charging the Austrian cuirassiers. In an uneven fight the latter held, while more Austrian horsemen moved into position. The Russian juggernaught rallied and ready to continue their assault. At this point we called a halt to procedings as it was almost 5pm and we'd been fighting since before 11:00. The game was declared an Austro-Russian victory as we'd captured all bar one of the key objectives set before the game started. While the French army withdrew Conrad and Shaun had an appointment to keep. What a cracking game! Both sides made some key errors, for example the deployment of all my cavalry on one flank was unnecessary and I made heavy going of crossing the river. My artillery was also pretty ineffective and should have been pushed forward in support of the attack. The French were too keen to let the Allies come to them which meant sacrificing some of the physical objectives, but more critically they allowed themselves to be hemmed into a very small space and were unable to make much use of their cavalry or even deploy their troops effectively. I'm getting the hang of Paul's rules and while I've enjoyed both the games I've played using them I still think they're a bit slow and too 'detailed' for my taste but I will willingly persevere as they have some excellent concepts contained within them as well. Thanks to Paul for umpiring and the lads for being such sporting players. "Dodging herds of sheep the Austrian reserves rushed forward" - now please tell me that was in the dispatches! What a great report Colin and a simply stunning looking table full of gorgeous troops. Very entertaining!. Outstanding game both visually and narratively. I was tempted just to post “Baaaaa🐏🐑🐑🐑🐑🐑🐑🐑” but thought better of it! A splendid looking game and AAR which I shall return to in due course I’m sure. Almost too much to take in at once. Another great looking game Colin and your war correspondent is excellent too! I am sure the French victory in Moscow on 16 July will have cheered the losing troops up somewhat! great game Colin, just love this period. Russians in bicorn, very nice! Yet another cracking game and a visual treat to boot:). Always great to see the sheep on the table and the ruined aqueduct looked fabulous, talk less of both armies which are a sight to behold. Some lovely looking units on both sides..
Super looking game, Colin...love that aquaduct. Just catching up from my break, and what a splendid post to catch up with. Bravo Sir. As ever Colin, am absolute feast for the eyes. Complex, sorry, detailed rules are a bit too rich for my liver these days, I guess it's an age thing. Having said that I will happily revisit rules I used 20 or 30 years ago as this seems less effort. But this has the effect of removing your rose tinted specs when you realise how rubbish they actually where!